Looks like Park Jihoon gained a lot of weight lately.. I think he looks way cuter now but there are a lot of fans who ask him to lose some weight..
1. [+81][-1] He didn't gain any weight, his face swelled up because he was sickㅋㅋㅋ There's no way for him to gain any weight when all he does is practice, practice, and practice..
2. [+80][-1] I think Park Jihoon is originally big boned, that's why he looks very manly..
5. [+23][-0] I don't care if he lost weight, gains weight, or gets swollen.. He's still gorgeous in my eyes no matter what..
6. 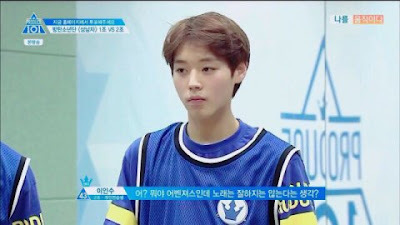 [+21][-0] I'm one of the audience who saw him on person during the final show.. He is really slim and he looks very handsome..
7. [+20][-0] He's just puffing his cheeks in that gif where he wears a pink training suit.. He lost a lot of weight throughout the show..
10. [+12][-1] I heard that he's the type of person who gets swollen very easily..
Mamamoo to come back with 'Yes I Am'!